Get your EVS Sample Report Today! Use technology to enhance this most basic of human skills: Emotional intelligence. The most powerful way to develop your emotional intelligence is through self-reflection and solving real-life challenges more thoughtfully. The EQ Coach is your companion to see yourself and others more clearly. 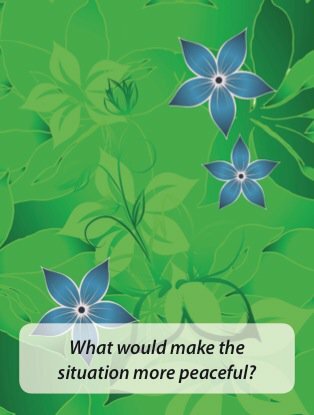 The EQ Coach is a set of powerful questions with beautiful, symbolic images, based on the amazing EQ Coach Cards. The App includes 64 cards and a simple note-taking tool (writing or voice) to capture your insights. 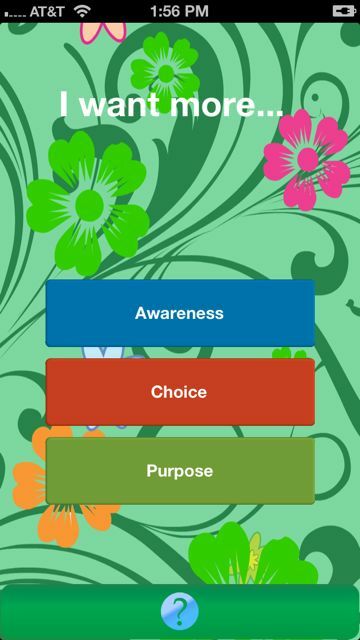 Just click one of the buttons to get a question to help you increase Awareness… Choice… Purpose. 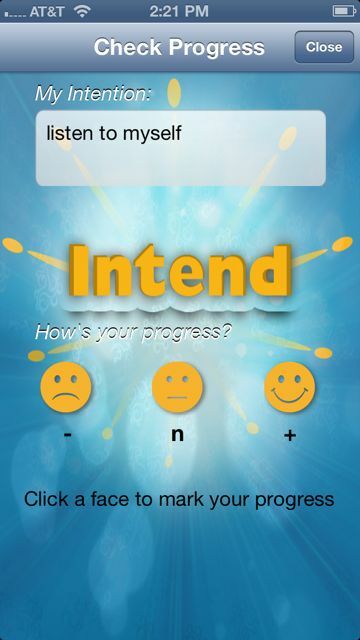 The App includes 64 emotionally intelligent questions for just $1.99. Swipe to flip the card for more depth. 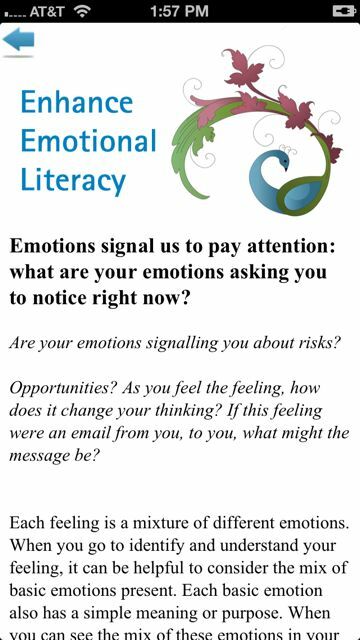 Slide up to learn about the emotional intelligence skill behind the question. There’s also simple note-taking tool (writing or voice) to capture your insights. Facing a challenge? Need insight? From the home screen (shown to the right), click to increase your awareness, expand your choice, or clarify purpose. When you click one of the 3 large buttons, a question will appear for your self-reflection. There is also a help icon (blue ? at bottom) with detailed instructions. To the right is an example “Awareness” question. Click the Home icon to return to first screen. Click the New Card icon (next to home, on the bottom) and you’ll get a new card in this category. Slide your finger to the LEFT to “flip” the card and get more in-depth questions related to this one. (or click the Flip icon, #3 from left). Slide your finger UP to read more about this emotional intelligence competency (or click the I icon, #4 from left). If you’ve purchased the full version (just $1.99, including all 64 EQ Coach Cards), then you can click the Note icon (#5 from left) to write or record your thoughts & feelings. The far right “help” icon gives you insight about this section (in this case, Awareness). Every card has a “flip side” with more in depth questions and explanations. If a card is useful to you, “flip it” to go further into the exploration. The cards are structured on the Six Seconds Model of Emotional Intelligence, so there are eight competencies. You can “slide up” any card (or click the I icon) to read about the competency, and why it matters. The Full Version includes a handy note tracker so you can keep track of your reflections. 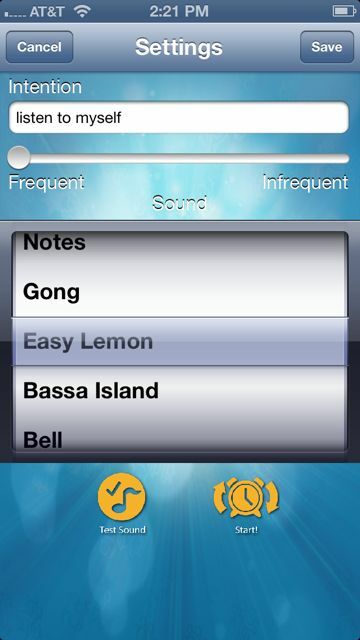 Each note can be a recorded memo or text, and you can email the note to yourself or someone else. You’ll then receive a question (selected from our EQ Coach Cards). Consider this question. If you’d like to go into more depth, “flip” the question over by sliding your finger across the card, or clicking the 3rd icon in the bottom row (from left). You can explore all three areas, and it can be useful to proceed through all three. Or, you can explore one in depth, or…. it’s up to you! Q: Can I get more help? A: Sure! You can post a question about the App on the comment section of this page and we’ll be happy to answer. You might also want to join our Facebook or LinkedIN groups for more discussion of this important topic. a simple, powerful way to focus your intention. Raise awareness. Change behavior. Elevate mood. Free in the App Store. Intend is a simple, powerful way to focus your intention. What do you intend to do today? Drink more water? Listen to yourself? Make more sales calls? Express gratitude? 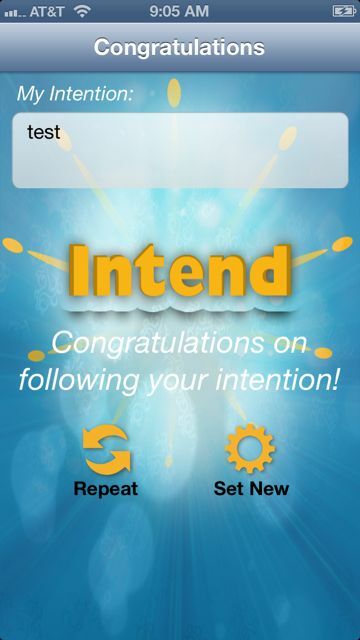 Intend is an incredibly simple tool to assist you in following your intention. Tapping the science of “random reinforcement,” Intend will help you take action on any goal by giving you a customized gentle reminder at random intervals. Intend is ideal for people working to create positive change – personally or professionally. We all know it’s easy to set a goal, but difficult to stick with the intention. Intend is your ally! You start with frequent (and random) reminders, and gradually reduce the frequency ‘till you’ve internalized the habit… then go onto another goal! Please use Intend for one week, and then take this brief survey to help us research the effectiveness of the tool. Use Intend for 1 week. Focus on one intention for the week. Use it for at least 2 hours per day. No need to use it during sleep hours. Optionally, you can enter your email at the end of the survey and we’ll send you the results. Three ridiculously easy, but very powerful steps to change. Take a six second pause. 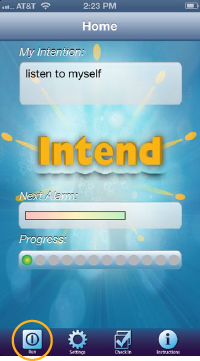 Click the Setting icon, type yourself a short message to remind you of your intention. Set a frequency: Usually you’ll start toward the left and gradually move the frequency toward the right. When the sound plays, you’ll see your message to yourself. Take action! You can just ignore the notice… or you can follow your intention. Smile: I’m following my intention. If your iPhone is locked, you’ll see the message on your lock screen. (Example shown to the right.) Again, you can ignore it… or just pause for six seconds, follow your intention, then get back to work. If you like, slide to unlock your phone, and you’ll see the rating screen. Give yourself a gift of recognizing this progress. Notice how it feels to have taken a step forward toward your intention. Now, you can click Repeat to continue with the same intention, or, you can set a new one, or, you can take a break. Please see the note below if you click Repeat. Just click the Run button again and the timer will start. Message: Your intention – a message from you to yourself. 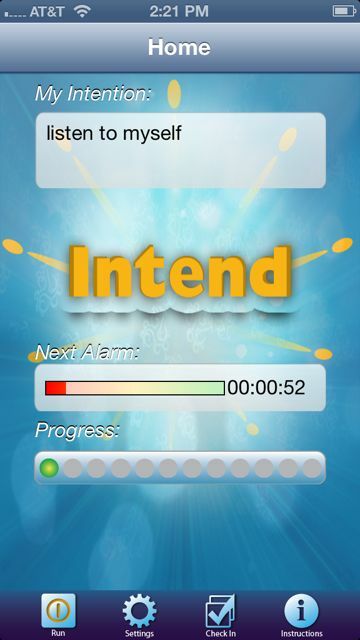 Frequency: How often do you want a reminder? It’s random, but you can set the range. On the far left, 1-5 minutes. In the middle, 1-3 hours. At the right, 3 hours-3 days. Sound: What do you want to hear as a reminder? Q: I’m not getting reminders. A: Check your iPhone NOTIFICATIONS in Settings. Make sure all the Notifications are on. Q: How long should I set the frequency? A: Start with the most frequent. 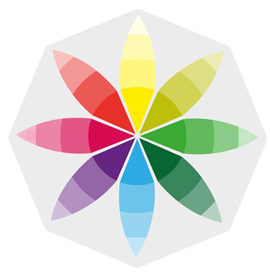 A simple, beautiful way to develop your emotional literacy and tune into to the insight of your feelings.